Stone Brewing has decided to pull its sponsorship of the NOFX's current tour after the band joked about last year's mass shooting in Las Vegas that claimed 58 lives and injured hundreds more. The joke was made during the band's performance on May 27 during the popular Punk Rock Bowling music festival in Las Vegas. In addition, the beer company says that it will be making a donation to the Las Vegas Metropolitan Police Department. NOFX has not made a comment about the incident. The band and its lead singer, Fat Mike, is well known for making controversial statements. "We played a song about Muslims and we didn't get shot. Hooray," Fat Mike said after one of the band's songs. 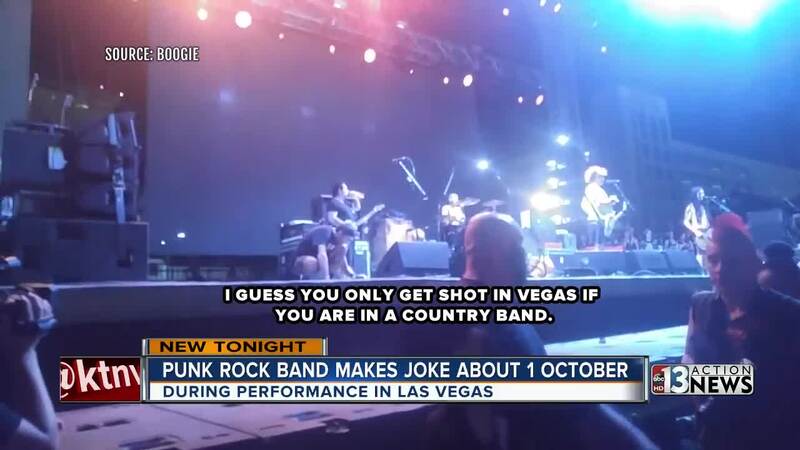 "I guess you only get shot in Vegas if you are in a country band," another band member said. Band members also indicated it was a good thing that it was country music fans that were shot and not punk rock fans. The band released the following statement on Thursday. 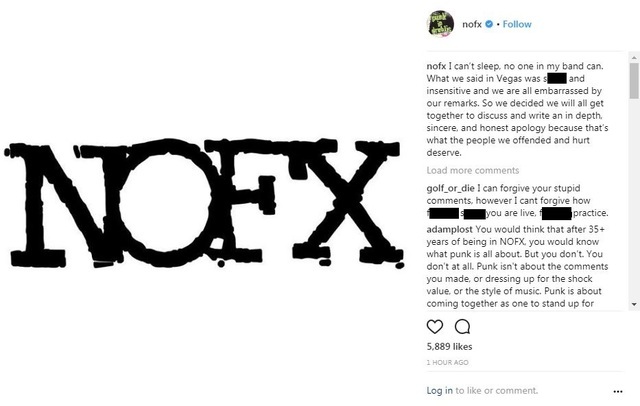 NOFX released a statement on Instagram apologizing for the comments. "I can’t sleep, no one in my band can. What we said in Vegas was s----- and insensitive and we are all embarrassed by our remarks. So we decided we will all get together to discuss and write an in depth, sincere, and honest apology because that’s what the people we offended and hurt deserve." 58 people were killed during the Route 91 country music festival on Oct. 1, 2017. Hundreds of more people were injured. The shooter has been identified as Stephen Paddock. He opened fire on the crowd from the 32 floor of Mandalay Bay. Before the shooting, Paddock checked out the location of Life is Beautiful, which is held in Downtown Las Vegas. He may have ben planning to carry out a mass shooting during that music festival but changed his mind. Stone Brewing issued the following statement. We at Stone Brewing are aware of NOFX’s insensitive and indefensible statements this past weekend. As a result, we are severing all our ties with NOFX, including festival sponsorship and the production of our collaboration beer. We respect punk rock, and the DIY ethos for which it stands. To us, it means standing up for things you believe in, and fearlessly committing to what's right. And it is for that reason that Stone Brewing is immediately disassociating ourselves from the band NOFX. Stone had a sponsorship deal for this summer’s Punk In Drublic festivals. Emphasis “had.” That sponsorship is now canceled. At this moment, there is Stone & NOFX Punk In Drublic Hoppy Lager in the marketplace that was brewed by Stone Brewing. It’s done already. Know that NOFX does not earn any money from the sale of the beer. safety programs, training and funding. We have cancelled any future rebrews of this beer. We apologize to the fans of the beer itself, but know that we make this decision out of respect to all. Punk rock is cool. These callous comments were the furthest thing from it. In light of NOFX's comments during their performance at the Punk Rock Bowling and Music Festival, we would like to offer a formal apology to those in attendance, the City of Las Vegas, the victims, and the families of 10/1.